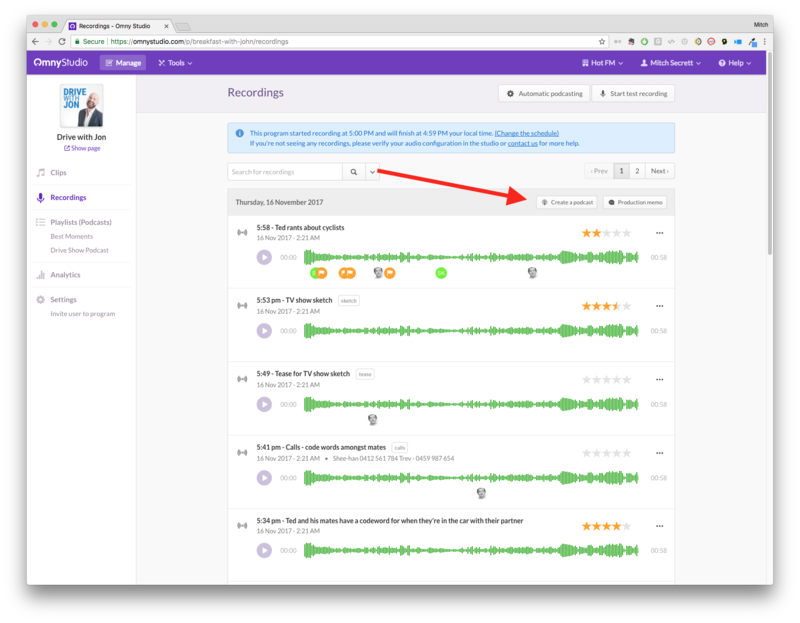 Once you have configured your recordings and have contacted Omny Studio support to activate automatic podcast publishing for your account, you'll see a new button appear on your recordings page. Click the button to configure your publishing schedule for each program and this box will appear. 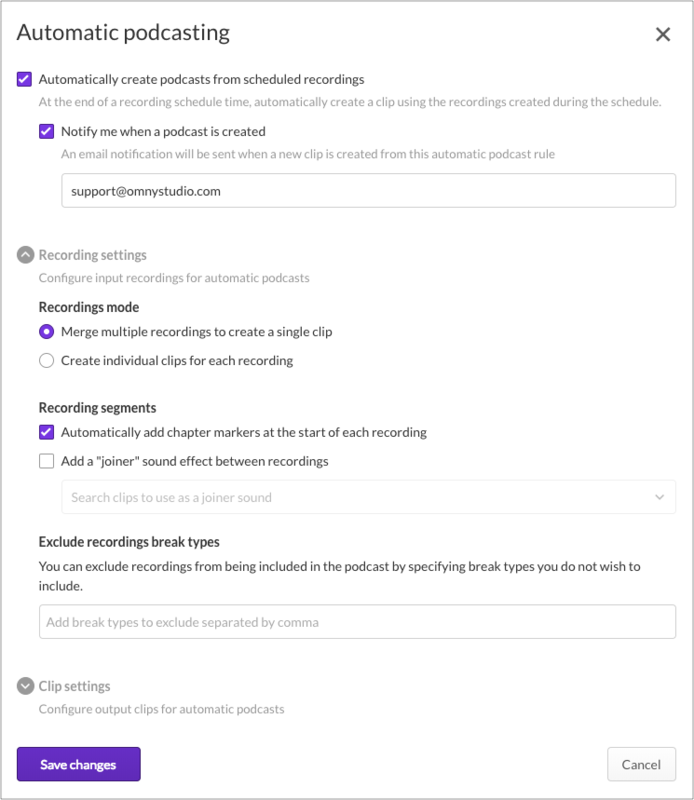 First, choose whether or not you'd like the system to be completely automated by checking the box at the top: "Automatically create podcasts from scheduled recordings" and setting an email address to be notified. If you leave this box un-ticked, all of the below settings will apply but you will need to manually click "create podcast" to publish your episode. Recordings mode - choose whether or not you'd like to "stitch" your recordings together or publish your recordings individually. Recording segments - choose whether or not you'd like chapter markers at the start of every segment. 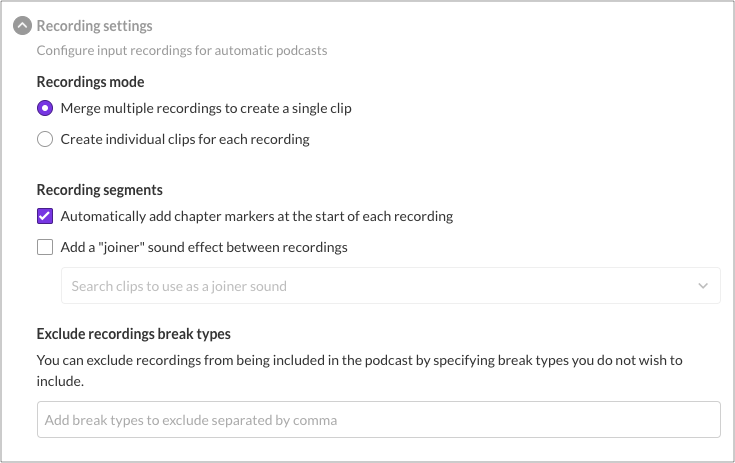 Recording segments - choose to add a "joiner" sound effect in between each recording from a list of uploaded clips. You'll need to upload a sound effect to do this. You can also exclude recording break types. For example, if you're recording songs into Omny Studio separately but you wouldn't like to include them in your published episode, simply type "song" to exclude them from the rules. Here, you can configure where the final episode will be published, the title and description of the episode and the clip visibility. 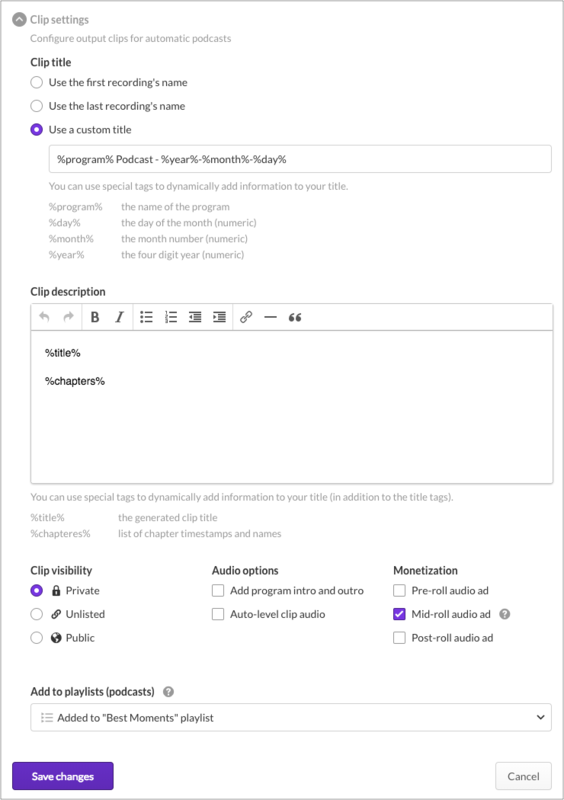 Clip title - create a custom title and description for each podcast episode using the special dynamic tags or simply name the file as the first or last recording's name. Clip visibility - keep the clip private if you'd like to review before publishing. For more on clip visibility head here. Audio Options - read more about add program intro and outro and auto-level clip audio - both options will be applied to the resulting clip. Monetization - click mid-roll audio ad to automatically ad a mid-roll add marker between segments. These markers will communicate with your ad-server to dynamically insert an ad at that point. Add to playlists - specify which playlist/s you'd like the automatically published clip to live in. Producers may want to take advantage of the automatic publishing features such as stitching multiple recordings without making it completely automatic. This will use your "automatic podcast" settings to create a podcast from that day's recordings.